Over the last few months, we’ve written a lot about some fantastic 3D designs which can be very useful in medicine – a cranium replacement, 3D printed skin, and especially bone and limb prosthetics. Now, 3D universe, a website dedicated to 3D printing, published an article comparing a $42.000 conventional prosthetic, with a $50 3D printed one. Jose Delgado was born without his left hand, and in his 53 years, he’s tried several options to support his disability, recently moving onto more advanced prosthetics. 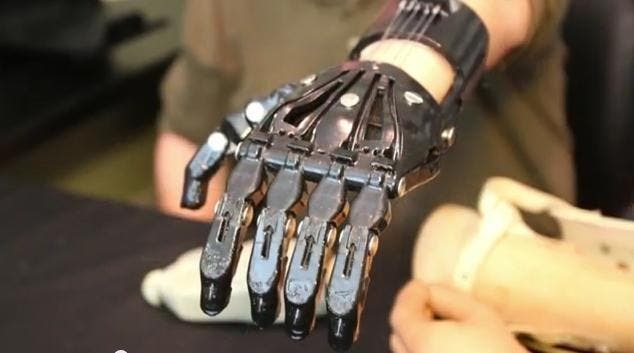 For over a year, he had been using a $42,000 myoelectric prosthetic device, which took signals from the fibers in his forearm and translated them into electric signal, moving the fingers of the prosthetic hand. He was lucky enough – his insurance covered the costs, but most people in the world don’t have this luxury. Jeremy Simon of 3DUniverse met up with Jose, and printed him a 3D prosthetic from Cyborg Beast. These are the open source 3D printed hands – anyone can take the design for free and print his or her own prosthetic. It’s really worth checking out if you or someone close to you is suffering from such a disability. At $50 for materials, it’s a very affordable financial effort. It seems really weird to compare one thing to the other – there is a huge price difference (840 times) – both Delgado and Simon were understandably skeptical – but after testing them both, Delgado declared that the $50 one was easily outperforming the counterpart he had been using for over a year. Sure, it’s a little bit more frail, and it will probably break sooner rather than later, but the solutions is simple – you just print a new one! 3D printing is really changing the world – and it’s doing so at lower and lower prices.